The reasons why we desire portraits of ourselves and those that we love today is the same ones that inspired the first cave paintings. They not only create a visual document of the person, but they also create a historical record of milestones in yours or your loved one’s live. And not just for ourselves, but for your family generations to come. How many of us have looked at pictures or our parents, grandparents and even great-great-grandparents seeking physical connections between us and them at the same stage in life. Oh you know you have. It’s how you know that you and your grandfather have the same crooked smile or have the same hairline when you were both in your 30’s. This is the main reason why I started Ivan Apfel Photography over 20 years ago as a portrait studio. I have always just loved taking photographs of people. If you are wondering what my portrait “style” is, I might have a hard time putting a finger on it. I guess I have more of a goal than a style. My goal is to capture my subject or subjects in a manner that most reflects them. Even when shooting families I will always photograph each member by themselves as well as in a group. Because in within a family each person has their own distinctive personality when it is just them and another one completely different when with their siblings, spouse, children or the full family. How I capture my portraits can really vary from subject to subject. For some, we shoot in a controlled studio with a seamless background. Other we might do a location studio using the home or yard as the background. For others it might be pure nature light in or outside. I will also photograph some portrait sessions using both studio lighting and natural lighting methods. It all depends on your desires and how we feel it would be best to capture you or your family. 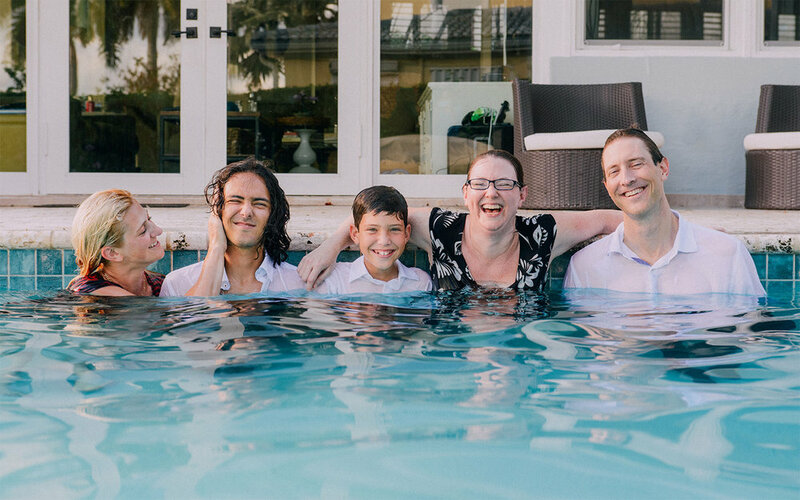 Especially when shooting families, I will capture posed images of each member as well as natural interaction images of the family being themselves. You can see a small sample of come of my client portraits below and a larger sample in my Portfolio. While my portrait commission pricing is pretty straight forward, I don’t have the traditional Package A, Package B, etc style pricing. Mine is based on whether it is a single person, or multi-person portrait commission as well as whether it will be a studio only, natural light only or combination of both. Single Person Studio Portraits start at $350 per commission and include the session, private online gallery, choice of 10 images fully retouched, final high-resolution full-sized retouched selections delivered via digital download, option to purchase additional retouched images and prints. Studio can be brought to you. Multiple-Person Studio Portraits (up to 5 people) start at $500 per commission and include the session, private online gallery, choice of 10 images fully retouched, final high-resolution full-sized retouched selections delivered via digital download, option to purchase additional retouched images and prints. Studio can be brought to you. Single Person Non-Studio Location Portraits start at $350 per commission and include the session, private online gallery, all final processed high-resolution, full-sized image files delivered via digital download, option to purchase retouched image files and prints. Multiple-Person Non-Studio Location Portraits (up to 5 people) start at $500 per commission and include the session, private online gallery, all final processed high-resolution, full-sized image files delivered via digital download, option to purchase retouched image files and prints. Single Person Mixed Studio + Non-Studio Location Portraits start at $500 per commission and include the session, private online gallery, choice of 5 images from the studio portion fully retouched, all final processed high-resolution, full-sized image files delivered via digital download, option to purchase retouched image files and prints. Studio can be brought to you. Multi-Person Mixed Studio + Non-Studio Location Portraits start at $900 per commission and include the session, private online gallery, choice of 10 images from the studio portion fully retouched, all final processed high-resolution, full-sized image files delivered via digital download, option to purchase retouched image files and prints. Studio can be brought to you.